In December of 2016, the Old Town Community Association held the first Christmas parade in the history of Goleta. Some folks thought it was the first parade ever in Old Town, but it was definitely not, just the first Christmas parade. This was most likely first ever parade in Goleta. Lifelong Goleta resident Marilyn Hill was kind enough to share some beautiful color photos from the festive event in 1949. The photos were taken by her father, Bill Seal, Sr. 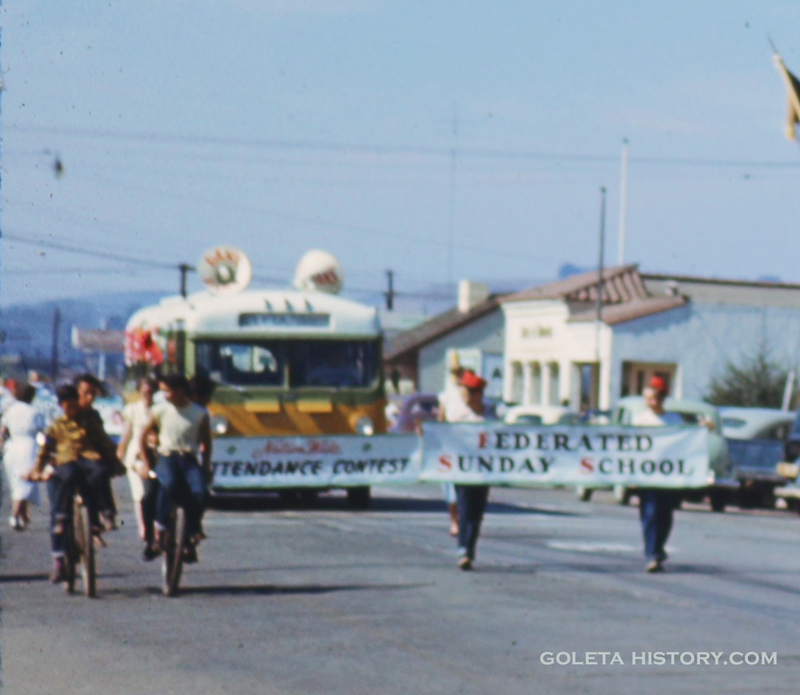 The parade was organized by the Federated Church of Goleta that was located on Chapel Street. What first caught our eye was how the parade is coming towards Santa Barbara in some of the photos…. Then in others, it’s going towards Ellwood. Evidently, the parade was so short it went up, turned around and came back down Hollister Avenue! The next thing that caught our attention were all the religious quotes on the floats. This was due to the fact that the parade was put on by a church, so it was mostly their production. With the exception of the Pioneer Girls, and their fancy decked out bikes! In fact, there were quite a few fancy bikes in this parade. A closer look and you’ll notice the fine Woody parked in the background with a kid hanging out the window. I know a lot of guys that would love to have that Woody today! Also notice the Camel Auto Court sign. This was the first motor hotel, or motel, in the area. The cool sign is gone now, but they were in business for a long time. In fact, some of the units still exist today and are being used as residences! … is now a 7-11. Not nearly as cool of a sign. Check out this beautiful vehicle. It must have been something special even back then because it’s in the parade! No signs or anything, just a bitchin’ ride. Behind the sweet ride you’ll notice the Goleta Rexall drugs with its classic sign. Today, the building still serves the community as the Family Discount store. And here’s an interesting historic tidbit we noticed. See the cool Rexall sign in this old photo, with Benny’s Liquors right across Magnolia Street? Here’s the same scene today. Does the old Sun Time tanning sign look familiar? It’s the old Rexall sign! At some point, it moved across the street and got repainted, but it’s still being used. This was back when Old Town was a relatively New Town. But it’s amazing how much has stayed the same! The building in the background shown here is still in use, but the businesses have changed. In 1949 it housed a gift and photo shop and a real estate office. In 2017, it’s Swim with Phyn and Aquatics Dive Shop. It did, and still does, have residences on the upper level. Where this young person can be seen enjoying the 1949 parade. Crismon’s Goleta Market was the only grocery store in town. Marilyn Hill remembers some of her schoolgirl friends had a crush on the dashing young Joe Kunze that worked there. Joe moved on to became the manager of the new 101 Ranch Market down the street. That changed to Santa Cruz Market soon, and Kunze remained the manager all the way until 1987, happily spending his whole life selling groceries in Goleta. Crismon’s had some aggressive pricing, with green chili peppers at 5 cents a pound! This young lady looks stunned at the coffee price, just 49 cents a pound! Crismon’s is still there today but it looks like this! The building lost the arches, but otherwise about the same. One thing that has changed is the power supply. Check out the telephone poles and street lights, dangling from above. Wouldn’t want to be on Hollister Avenue during a big earthquake back then! Another thing that has changed is the way cars parked on Hollister. Notice in the background how they parked diagonally. Probably added more parking spaces to the street, but can you imagine backing out of your space into heavy traffic today? Or riding a bike down Hollister with cars blindly backing up into you? Would not be too safe. Looking up Hollister towards Santa Barbara it’s interesting to see how many large trees were on the horizon. Also, check out the cool little scooter in the right foreground. A closer look reveals a large building on the right. At this time, it was a Caterpillar Tractor sales and service shop, but a couple years later it became a grocery store. Today it’s the aforementioned Santa Cruz Market, and it hasn’t really changed much. These happy gents were enjoying their ride down Hollister. This is one thing the 2016 Christmas parade didn’t have any of, horses! Marilyn Hill remembers Goleta farmer Frank Lane used to ride his horse into to town to run errands. He may be one of these horsemen. This was the only other horse in the 1949 parade. The Goleta Federated Church bus. Looks like it had already been around for a while. Wonder what was blaring out of those big loudspeakers on the roof…. The kid on the balcony doesn’t seem too impressed. This float featured a young lady playing a huge accordion, followed closely by another bike brigade. The turnout to watch the parade seemed a little light, much less of a crowd than the Christmas Parade of 2016! But the population of Goleta back then was a fraction of what it is now, so that makes sense. Overall, it looks like a fun, family event for a small agricultural town. More importantly, it gives us a glimpse of a day in the life of Goleta in 1949, and in color no less! Thank you Marilyn Hill for sharing these great photos. And looking at pictures of the 2016 Christmas Parade, it helps you realize how little some things have changed in half a century….. This is such a more complete History of Old Town that I have seen so far. I have lived there since 1997 and am in the old Camel Court cottages. I love it!!! It still feels like home and I have always felt safe here. Thank you for posting this. I am seeing these for the first time. I think you have and error in your research. My parents owned LA ESMERALDA MARKET which was started on Orange Ave sometime in the late 40’s. I cant remember the exact date they are gone now. From there they moved the business to 231 Magnolia Ave. and remain there until mu dads passing. His name was Ralphel Trancoso. The Goleta paper wrote many stories about the business. So maybe your research was like the Crismons Market was like in the early 40’s?? I would like to know because my folks helped a lot of people by letting them charge their groceries until pay day my dad also would deliver them their groceries. So if can acknowledge them in your history posting that would be so great because they did so much for the community. OK cool, but I’m not sure what the error is? Please state exactly what the error is and I’ll fix it. In the meantime, I would like to do a story about La Esmeralda Market. Do you have any photos.